Members of liberal and Christian political groups protested against visiting US secretary of state Hillary Clinton last weekend. They accused Washington of cutting a ‘secret deal’ with Egypt’s radical Muslim Brotherhood. The New York Times is upset with US conservatives. Not only does the Old Gray Lady insist that conservatives are behind rumors floating around in Egypt, but the NY Times also says US bloggers enjoyed it when Egyptian protesters chucked shoes and tomatoes at Hillary Clinton. Updated | Tuesday, 10:03 a.m. The news that Secretary of State Hillary Rodham Clinton’s motorcade was pelted with shoes and tomatoes by Egyptian protesters, who also taunted her by chanting “Monica! Monica!” as she left the U.S. consulate in Alexandria on Sunday, delighted conservative bloggers in the United States. 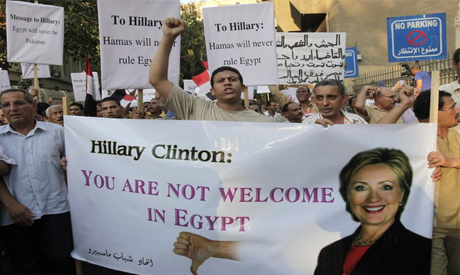 What has attracted less attention, however, is the extent to which the Egyptians who vented their rage during Mrs. Clinton’s visit appear to have been inspired by fears that the Obama administration harbors a secret, pro-Islamist agenda which originated with American conservatives. The strength of that belief was on full display on Saturday in Cairo, as hundreds rallied outside Mrs. Clinton’s hotel, waving placards that read: “Stop U.S. funding of the Muslim Brotherhood,” “Clinton is the supreme guide of the Muslim Brotherhood” and “To Hillary: Hamas will never rule Egypt,” suggesting an even-wider conspiracy, including the Islamists in neighboring Gaza. After all, it was the NY Times that raised Muntadhar al-Zaidi to celebrity status after the Iraqi radical chucked shoes at Goerge W. Bush in Baghdad. In fact, they assigned Muntadhar folk hero status in their report titled, “In Iraqi’s Shoe-Hurling Protest, Arabs Find a Hero. (It’s Not Bush.)”. A day after an Iraqi television journalist threw his shoes at President Bush at a news conference in Baghdad on Sunday, his act of defiance toward the American commander-in-chief reverberated throughout Iraq and across the Arab world. In Syria, he was hailed as a hero. In Libya, he was given an award for courage. Maybe the hypocrites at the NY Times ought to look in the mirror before that start accusing conservatives of political games.